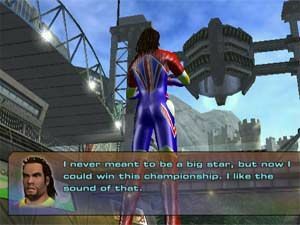 In the 22nd century, racing has become an intergalactic obsession and racers are revered as heroes. The Quantum Redshift is a world champion racing competition that lets you race against 16 other racers in speeds that exceed 500 kilometres per hour in your Single Person Armed Racing Craft (SPARC). As the old saying goes "if at first you don't succeed, then try try again", unfortunately the racers of Quantum Redshift championship ignore this motto as there can only be one winner and a string of losers that are closely followed by the dead. 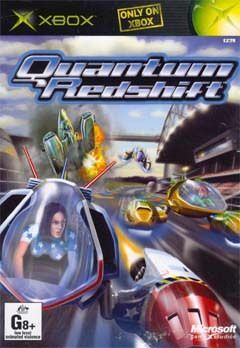 Quantum Redshift takes place in the distant future where you play the role of a Quantum Redshift Championship racer. Your vehicle, the SPARC lets you travel in speeds of excess 500kph and gives you access to over 150 different weapons. The premise behind Quantum Redshift is a futuristic racing game where you must become world champion but in order to do this, you must shoot, race and maim your way to victory. Tournament mode is main method of gameplay in this game and lets you unlock a variety of different vehicles, weapons, new tracks and characters. This mode also features an in-depth storyline (with cutscenes) of the characters you race against. The game features five different difficulty settings that range from novice to redshift champion. The basics of controlling your SPARC is accelerate, powerslide, brake and attack. The courses are littered with a plethora of powerups such as new weapons and shields. The developers have done an awesome job in creating high speed races that almost make you feel that you are racing at super speeds. The game screen contains a lap, shield, speed, time and turbo meter to show you a variety of details such as how low your shields are or when your next turbo is available. Although Quantum Redshift is a good game, the more you play it the more frustrated you will become. As you progress in the game, the gameplay becomes faster and becomes almost impossible to play, especially when you want to turn a corner at super speeds. Thankfully, Quantum Redshift offers a very interesting storyline that makes this game kind of addictive. The rivalry between players becomes a key aspect of the game and if you have a particular rival, they will try their hardest to make your race extremely difficult for you. Once you win a track, you are given money to help tune your SPARC that allows you to upgrade your weaponry, turbo and shield systems. 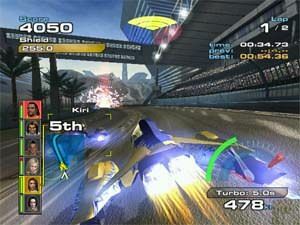 Apart from the Tournament mode, the game also offers Time Attack, Quick Race and a multiplayer mode. Graphically, Quantum Racer is a very nice looking game that keeps a constant 60 frames per second which is extremely good for a racer. The game tracks have this futuristic feel to them and some of the water effects will truly bedazzle you. Apart from the great looking tracks, the game features some impressive weapon effects with awesome particle and lighting effects. Quantum Racer features a soundtrack done by Junkie XL that sounds a little too forced and techno for my liking. Fortunately, Quantum Racer lets you customize your soundtracks so you can have your own soundtrack if you wish. The sound effects of Quantum Racer feature all the right sounds that you would hopefully hear if you were racing a futuristic SPARC racer. From the roar of your engine to the your guns blazing and the sounds of rain on your windshields, Quantum Racer has some great sounds. It should also be noted that Quantum Racer features true Dolby Digital 5.1 that sounds great if you have the correct surround sound speaker setup. In conclusion, Quantum Racer is a fun old school racing game that brings together the power of the XBox with an interesting storyline. 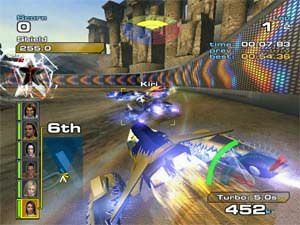 Like most futuristic racers, the longevity of the game is limited but fortunately it has an interesting multiplayer option that is sure to keep you and your friends amused. Check it out!